In this image taken from a video footage from AP Video, a woman holds up a photo of her son, a missing firefighter, outside a hotel where officials held a daily media conferences in northeastern China's Tianjin municipality, Aug. 16, 2015. The Chinese public continues to demand answers over the cause of last week’s massive blasts in the northern port city of Tianjin and the risks posed by the chemical fires that followed. Authorities announced that the death toll from the blast continues to rise, with 114 dead and more than 70 others still missing, most of them firefighters. Authorities say they are still working to establish the identity of more than half of those pronounced dead. On Monday, dozens of angry residents who saw their homes severely damaged by the blast rallied outside a building where Tianjin officials briefed the news media. A man with his wounds bandaged rests outside a hospital receiving victims of an explosion in northeastern China's Tianjin municipality, Aug. 13, 2015. Some protesters carried pictures of the injured, whose faces were cut by debris in the blast. Others had fresh bandages on their heads and arms. "Now our homes have been destroyed, can't the government give us an explanation?” asked a 60-year old woman surnamed Wang. “You can't just tell us all you are going to do is give us new windows. What about all the other stuff in the house, why should we have to pay for this?" Residents are asking that the government hold talks with them and provide them with answers. Officials say that an investigation into the disaster is underway and that if any violations are uncovered, punishment will be dealt out accordingly. Many were concerned that the plight of more than 6,000 residents who have been displaced was not being given enough attention. "We just want to say that so far the media hasn't mentioned us, we feel like we've been forgotten, we just want to say that there are still us, that's all,” said Li Chengze. At Monday’s news conference, it was still unclear what the government plans to do to aid those who have been forced to evacuate their homes in the wake of the incident. Tianjin Vice Mayor He Shushan, who was attending the press briefing for the first time, had very little additional information about how it was that the warehouse was allowed to operate so close to a residential area. “A special task force that has been set up under the State Council will thoroughly investigate and provide answers to questions regarding the distance of residences [from the blast site] and other questions such as the approval process [for the warehouse],” He said. An environmental impact assessment was conducted when Ruihai International was allowed to convert its warehouse into a facility that could temporarily house hazardous and dangerous materials and chemicals. And while the review acknowledged risks, it said that the site was safe enough for operations. 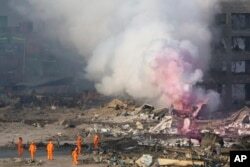 Chinese media have suggested a reason why the warehouse was able to operate so close to residential areas was because of the political connections of the company at the center of the blast, Ruihai International. According to a report by the Chinese financial magazine Caijing, one of the shareholders of the company is suspected to be the son of a former Tianjin police chief. The report said the son, Dong Mengmeng, was a shareholder “for some time in the past.” A review of the company’s list of shareholders has also raised further questions as those who are said to be major controllers of the company may have been shareholders only in name, according to the report. The website Sohu News has also reported that Dong Mengmeng has previously used the name Dong Ruihai in his business dealings. Concerns continue to rise about the possible spread of sodium cyanide at the site of the blast and the deadly mix of other hazardous chemicals and materials. In an apparent effort to stop the spread of rumors and avoid sparking further public panic, Chinese authorities efforts to control content online has kicked into overdrive. State media had reported that more than 400 websites and social media accounts have been shut down. Some have been taken in for questioning. State media have highlighted measures that authorities are taking to monitor air and water quality around the site. Even so, the vice mayor of Tianjin told reporters Monday that 700 tons of sodium cyanide remain in the core area where the blast took place. Authorities have assured residents that there is no need to worry, but with weather forecasters predicting rain, concerns continue to rise that the chemicals could spread. Tianjin environmental official Bao Jingling said authorities are closely monitoring the situation. "At present, the spread [of chemicals] is not very bad. In terms of [the situation] after the rainfall, we still haven't seen any rainfall, but we've already made a precautionary plan to closely monitor. So please don't worry about it," Bao added.